Agrigento, 이탈리아의 아그리투리스모 레기아 사라체나 | 호스텔월드에서 예약하세요. 'REGGIA SARACENA' FARM HOUSE wiht POOL,GYM,PLAY GROUND AND FREE PARKING AND BREAKFAST located in an ancient totally refurbished manor house sourrounded by a beautifull widegarden. In its roomsyhe modernity of furniture meets the savour of the past in the luxurious finishing,the large terraces,the majolica and stone fireplaces.the rooms are furnished in stile and have bathroom,TV,heating or A/C, terrace. We offer olso free , relax area with amache and bed in the garden,SWIMMINGPOOL, play graund, montabike, ping-pong.The milieu,the management,the sicilian culinarytradition as well as the farm position, not far from the -templum Valley km 9 and from sandy beaches km 12, make your stay unforgettable. 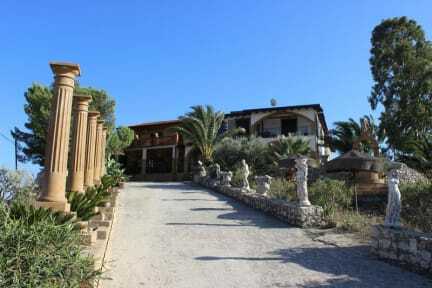 This B&B is located 6-7 km from Agrigento.